R.T. Foard Funeral Home, P.A. Thank you for your support during this difficult time. Please enhance this tribute to Martin by adding your memories and photos. Martin P. Shestock, age 99 of Chesapeake City, MD passed away on July 23, 2018. He was born on September 4, 1918 in Chesapeake City, MD to the late Alex Shestock and Anastasia (Kusnevich) Shestock. Martin loved his country and proudly served in the Army during WWII in the Pacific theatre. 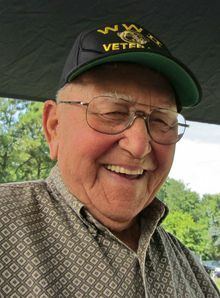 He always wore his WWII Veteran hat with pride and honor. After the war, he pursued a career as a heavy equipment operator for The Army Corp of Engineers. In retirement, he worked as a security guard at Indian Acres in Earleville. He was a member of the American Legion in Rising Sun and a life member of the Volunteer Fire Company No. 1 of Chesapeake City. He was a devout Ukrainian Catholic and never missed a weekly service. Martin will be remembered as a gentle, loving man who always put his family first. He loved being outdoors and farming the land with his siblings, always sharing his fruits and vegetables with family, friends, and neighbors. Martin is survived by his loving wife of 60 years, Phyllis Shestock of Chesapeake City, MD; grandson, Martin Stringer of Chesapeake City, MD; niece, Theresa Williams of Glen Burnie, MD; nephews: Wayne Senior of Cullman, AL and Joe Piri (Donna) of Chesapeake City, MD; step granddaughter, Rene Kaveria (Adi) of Edison, NJ; sister-in-law Irene Shestock of Chesapeake City, MD; and several great nieces and nephews. He was preceded in death by his daughter, Christine Shestock-Donahue; siblings: Anna Shestock, Mary Shestock, George Shestock and Catherine Piri; and niece Phyllis El-Dahouk. A visitation will be held on Monday, July 30, 2018 from 6:00-8:00PM and Tuesday, July 31, 2018 from 10:00-10:45AM at R.T. Foard Funeral Home, P.A., 318 George Street, Chesapeake City, MD 21915. A celebration of Martin's life will be held on Tuesday, July 31, 2018 at 11:00AM at St. Basil Ukrainian Catholic Church, 231 Basil Avenue, Chesapeake City, MD 21915. Burial will follow at St. Rose of Lima Cemetery. In lieu of flowers, memorial contributions may be made payable to, "St. Basil Ukrainian Catholic Church" and sent in care of the funeral home, P.O. Box 248, Rising Sun, MD 21911.